The Greatest Retirement Gift Ever, "When the Day is More Important than the Hour"
Finally, a wall clock designed for those who are fortunate enough to measure life by the day. Your friends and loved ones will keep track of RV adventures, tee times, fishing trips and sunsets on the beach with this great new gift idea. 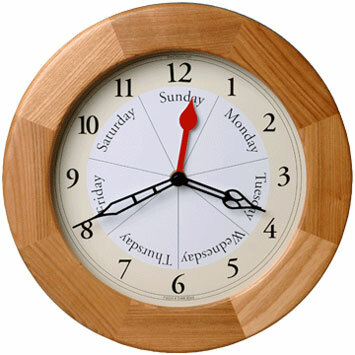 The patented DayClock helps you keep track of the days of the week. ©2007 Elegance in Time, Inc. All rights reserved.